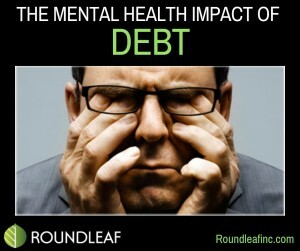 Owing serious sums to your credit cards and other debt accounts may just be business and numbers on paper, but if you’re in that financial situation, then you know that the stress, pressure, and worry about paying bills has profound mental health implications. Of course, different people experience the gambit of reactions and psychological effects when faced with debt. While one person may feel like they’re in the bottom of an endless dark hole while they’re $5,000 in debt, others may be comfortable managing $100,000 in revolving debt. Each person, situation, and psychological impact is different, but researchers, mental health counselors, and studies have pointed to some common threads. There’s a direct correlation between debt and feelings of depression. In fact, a 2010 UK psychiatric study found that people who had high levels of debt experienced depression, low moods, and other mental health problems at twice the normal rate. Likewise, a study by Social Science & Medicine concluded that people who are overwhelmed with debt suffer significantly higher levels of stress, anxiety, and depression. A clinical psychiatrist named Dr. John Gathergood did extensive work into the correlation between debt and the prevalence of anxiety. He found a clear increase in anxiety levels as debt levels rose, and 29% of people with significant credit card and debt balances reported severe anxiety. Of course, anxiety is already at epidemic levels these days, but debt is one phenomenon that triggers anxiety at an acute rate, including physical symptoms like sleeplessness, headaches, muscle tension, upset stomach, fatigue, and more. If it seems like we’re all stressed about money and debt these days, it’s because it’s true! According to the American Psychological Association, 72% of Americans – nearly three out of every four – are stressed about their finances including debt, and 22% even suffer from “extreme” money stress. Additionally, a study by the Associated Press found that consumers with debt report more health issues like stress and the aforementioned anxiety and depression. Of course, sleepless nights spent worrying about debt and financial issues compound the mental health impact, exacerbating depression, anxiety, stress…and more insomnia. One study found that 64.5% of respondents with debt suffered sleepless nights due to worries about how they would pay it. Poor and insufficient sleep makes your days feel like an uphill battle, impacts your relationships, and saps your energy – lowering your overall quality of life according to the Mayo Clinic. Mounting credit card balances, medical bills, student loans, and other debts don’t just make your life miserable; they actually make you less productive at work. An American Psychological Association study of graduate students found that 64% of people say that concerns over their debt kept them from functioning optimally. Of course, unproductivity at work, lost wages, sick days, mistakes, and accidents at the workplace and a host of other intangible effects make our credit card, debt, and financial issues even worse, creating a vicious cycle. We often blame someone (or something) else for our debt by displacing the anger, stress, and negative feelings we’re experiencing. Too often, that burden is shifted onto our husband, wife, or romantic partner. In fact, money and debt issues are the leading predictors of divorce, according to Sonya Britt, a Kansas State University professor of family studies. But we also may harbor ill-will, even subconsciously or passive-aggressively, towards our children, coworkers, bosses, friends, and others. They say that depression is just anger turned inwards. Although not a clinical definition, it explains why so many people are stewing with frustration, vitriol, and anger over their financial situations. The anger over our debt morass isn’t confined to credit cards or student loans. One study by NerdWallet found that 56 million American adults are struggling to pay their medical debts and bills, and that’s the #1 reason for personal bankruptcy filings! Many people deal with their depression, anxiety, and stress by cutting themselves off from the outside world, becoming isolated from family, friends, and others at exactly the time when they need to open up and accept their help. In fact, one survey found that 74% of respondents withdrew from others and social circles and became more isolated when faced with increasing student loans, credit cards, and other debt. While some of us can’t stop thinking about our credit card balances and other debt woes, some folks do the opposite and stick their head in the sand, entering into a state of denial about their finances. A recent CrediCard.com study found that 85% of respondents with significant balances were hesitant to even talk about their debt. When it comes to debt and finances, not tackling the problem head-on only makes it worse, compounding the mental health impact. Add it all up, and many consumers feel hopeless, destitute, and beyond saving when it comes to their high debt load and mounting balances. In one study, 61% of people said they felt like their debt was spiraling out of control with no end in sight. Hopelessness can be the worst feeling of all and have the most harmful mental health repercussions. The good news is that there’s ALWAYS help and a way out, and your mental health will improve, and your stress and anxiety levels decrease as you look at the situation clearly with the help of a professional. At Roundleaf Inc., we’re not therapists or mental health counselors, but we are the industry leady in successful debt negotiations and settlements, allowing people who are buried in credit cards and other debt to find a way out!